Our Brand Spankin New President Elect inspired me to create several pieces. Look for an entire line in the spring. 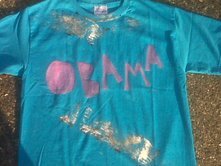 This entry was posted in Fashion, Twitter and tagged Mr. President, Obama, Obama Party, Twitter. Bookmark the permalink.